Sadly my old DVD player has finally packed up after ten years of loyal service, and since the-powers-that-be have cunningly decided to encourage internet piracy by making it impossible to buy region-free players off the shelf, I’ve had to start looking for R2 copies of my fave American shows and movies… so I was relieved to find that the UK release of the first season of The Sarah Silverman Program (2007) was almost identical to the US version I already owned… though sadly, the later seasons still aren’t available on this side of the Atlantic, dammit! I’ve watched my R1 version of S1 to death by now, and know many of the jokes by heart, but I still found myself laughing aloud at the anti-heroine’s adorable, oblivious, and offensive antics. 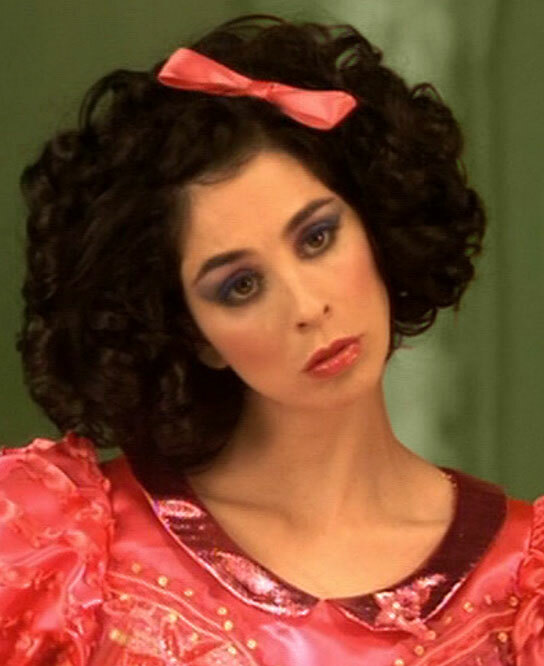 Sarah Silverman is such a dynamic and charismatic performer, with a truly unique cartoony energy… and this show gives her plenty room to show off, with its surreal tone, and jaunty musical numbers. It isn’t quite as mind-blowing as Jesus is Magic was, but it does tackle some very contentious subjects with gleeful abandon, and go to places that most right-thinking sitcoms would fear to tread. Playing Jekyll to Sarah’s Hyde is real-life sister Laura Silverman, who was cast as her long-suffering on-screen sibling here, and steals numerous scenes with her sweet-hearted nurturing and sneaky ad-libs. Their a cappella duet on “White Dog Poop” is also the highlight of the DVD’s special features section, imho… and almost worth the admission price by itself! Other notable supporting actresses included: Laura Hayes as an “Old Woman” that Sarah insulted while shopping for cough syrup (ep #1.1)… Missi Pyle as the host of a local talk-show who took an interest in Sarah’s charitable stewardship of an unstable homeless man, while ‘The Ghost’ of his dead mother (Jill Talley) kept trying to warn Sarah how dangerous he was (ep #1.2)… Rachael Harris* (aka Rachel Harris) as an unsuspecting ‘School Teacher’ who invited Sarah to speak to a class of children about her supposed illness (ep #1.3)… Talley (again) as a religious neighbour Heather ran to after growing sick of Sarah’s overbearing attitude, and Justine Dorsey as a very assured and impressive pageant rival (ep #1.4. 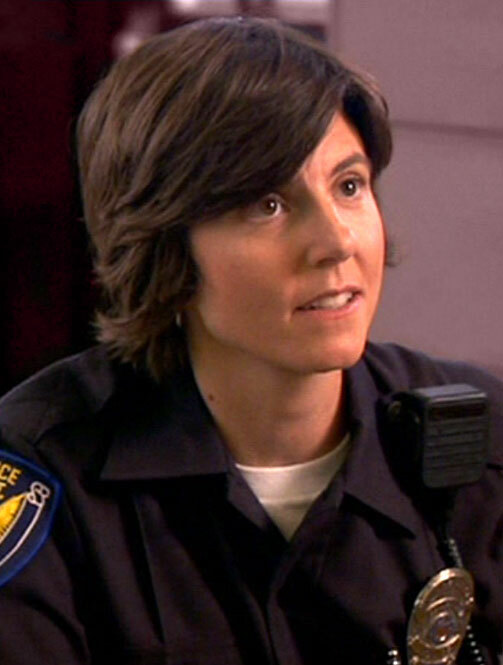 )… Tig Notaro as ‘Tig’, the new partner of Laura’s policeman boyfriend (Jay Johnston), who Sarah developed a confusing crush on (ep #1.5)… and finally, Candace Brown as ‘Natalie’, a sheepish friend who needed help moving house (ep #1.6). Note: This was the pilot episode for the series, but it was scheduled as the finale, despite the dis-continuity this causes when you watch them in the prescribed order. Tch! * Last week I watched the leaked pilot of Fox’s Lucifer TV series, in which Harris plays a flirty therapist who’s compromised by the title character. At first I found him (and the show) rather dickish, but it improved a lot once Lucifer started working with a cynical homicide detective (Lauren German), and she explicitly called him out on his douche-y smugness. Hurrah! Harris was also very funny, and looks set to become a recurring character, so I’ll happily watch another couple episodes of this supernatural procedural when they finally get around to airing it… sometime in 2016…? This entry was posted in Rants about TV and tagged Candace Brown, Heather Silverman, Jill Talley, Justine Dorsey, Laura Hayes, Laura Marano, Laura Silverman, Lauren German, Lucifer, Missi Pyle, Rachael Harris, Rachel Harris, Sarah Silverman, The Sarah Silverman Program, Tig Notaro. Bookmark the permalink.